Our compact, lean vacuum furnaces bring all the benefits of quick, clean induction heating technology to your manufacturing cell or laboratory. Ideal for brazing and heat treating processes that require high part quality and heating consistency, these induction furnaces heat parts of virtually any shape in a high temperature, high vacuum environment or in partial pressure of an inert gas. In our vacuum systems, parts are loaded into a steel chamber which is then pumped free of air and other gases before the heating process begins. Brazing or heat treating in a high vacuum environment offers a high degree of process control and produces exceptionally clean parts - free of oxidation and scaling. In contrast to flame heating and resistance heating, a vacuum furnace heats the entire part and not just the joint area. With induction heating, it is possible to specifically design the current flow that is induced into the part or susceptor (hot zone), thereby precisely controlling the heat pattern and therefore the amount and area of heat. Cycle times are greatly reduced, and parts may be quickly processed individually or in small quantities as needed. 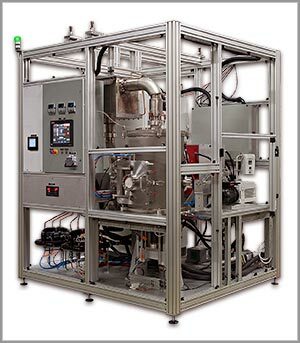 For manufacturers and lab managers who are searching for new ways to improve energy efficiency and reduce operating costs, our induction vacuum furnaces provide an excellent example of how lean, green technology can have a positive impact on the bottom line. When compared to a traditional large vacuum furnace system, VF Series Vacuum Furnaces can reduce overall all cost of ownership by as much as 75%. It’s easy to set up a continuous manufacturing flow, run various processes throughout the day and realize up to 90% improvement in overall cycle time. Due to the heat source (typically radiation/convection) generally used for vacuum processing, heat cycle times have been the limiting factor in reducing process cycle time. Now, by integrating innovative induction heating with a small vacuum chamber, continuous-flow manufacturing can be realized. The use of induction heating eliminates the long heat cycle-time requirements of a conventional vacuum furnace. Through the use of induction, the necessary heat is produced quickly, efficiently and directly into a small graphite susceptor, which radiates the heat uniformly into the part. 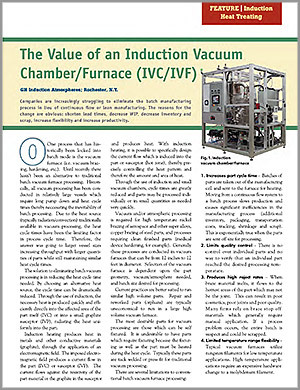 To learn more, please read our Vacuum Furnace NPV Analysis. Three different configurable VF series base models offer a range of hot zone specifications, operating temperatures, power and gas usage. Custom design and modification are always available. GH IA Induction heating vacuum furnaces are ASM 2750 compliant for thermal processing equipment used in metal heat treating applications. Our furnaces are protected by US Patents 6,649,887 and 7724045. Other patents pending.